Coming to the Tay Nguyen Gong Culture Festival in 2018, visitors will be able to enjoy gong sounds of thousands of thousands, learn the rituals and traditional festivals of ethnic groups in the Central Highlands. 1,000 folk artisans, performers of art troupes in the Central Highlands to participate in this festival. Festival of Gong Central Highlands 2018 officially began from 29.11, this is one of the largest festivals in the Central Highlands. Accordingly, the festival will take place from November 29th to December 2nd, officially opening at 20h on November 30th at the Dai Doan Ket square (Pleiku City, Gia Lai Province). Coming to the Festival of Gong this year, visitors will surprise with the most interesting and true experience, bearing the identity of each ethnic group in the land of the Central Highlands. Up to now, 11 main activities within the framework of the Festival have been prepared by provincial departments, branches and artisans from 5 provinces in the region such as: street festival, Day of gong culture in Tay Nguyen, restoration of ceremonies, traditional festivals; Performing folk art sculpture, weaving, brocade weaving; Folk arts and entertainment activities; Photo exhibition on cultural space of Central Highland gong, workshop on preserving and promoting the heritage value of Tay Nguyen gong culture space, announcing community tour and organizing tourism survey; Street coffee, Western Highland cuisine and cuisine of 3 regions, Featured products of the Central Highlands. 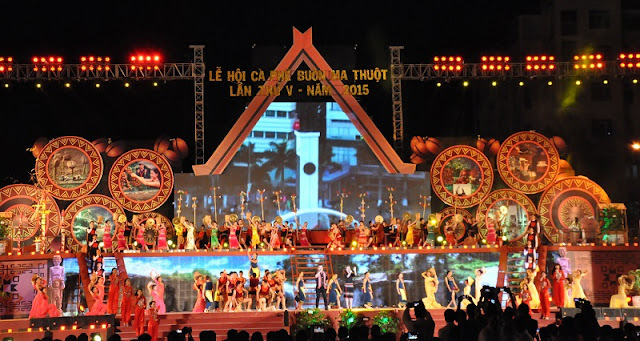 One of the most authentic activities of each ethnic group is the traditional ceremony of more than 1,000 artisans from five provinces: Gia Lai, Kon Tum, Dak Lak, Dak Nong and Lam Dong. In addition, visitors also have access to, admire the unique culture, costumes and musical instruments at the street festival with the participation of more than 1,000 people belonging to 26 art troupes from 5 Central Highlands provinces. The Central Highlands Gong Festival is an important cultural event in order to honor, preserve and promote the special cultural values of the Central Highland gong cultural space - the intangible cultural heritage the face of humanity. The festival of gongs is also a chance to promote the image of nature, people, potentiality, tourism strengths of Gia Lai province in particular and the Central Highlands provinces in general to friends and tourists in the country and internationally.